On Monday night New Jersey Devils goaltender Martin Brodeur blanked the Pittsburgh Penguins to record the 104th shutout of his career. That surpassed the great Terry Sawchuck for the most ever. Just two games after setting the mark for the most appearances by a netminder, he shut down the vaunted attack of the reigning champions to top the 40-year-old shutout mark. The 37-year-old Brodeur has spent his entire 17 year career with the Devils that has included three Stanley Cup victories, 9 All-Star Games, four Vezina Trophies, the Calder Trophy, and the first Canadian Olympic Gold Medal in 50 years. 3rd goaltender to win the Stanley Cup with a Game-7 shutout in 2002–03. Brodeur has also acquired more than 30 franchise records, including most all-time, regular season and playoff wins, shutouts, games lowest goals-against-average. Basically, Brodeur has ended all discussion about who is the best goaltender of all-time. There have been plenty of great goalies throughout the years, too: Sawchuck, Jacques Plante, Patrick Roy. Still, Broduer has accomplished more than all of them. 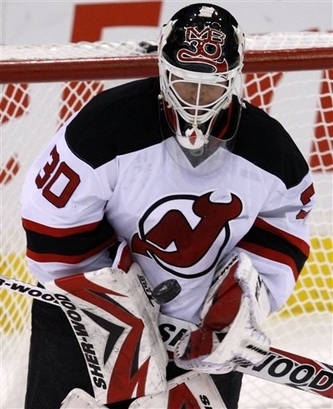 So congratulations to Marty Brodeur and the Devils. Enjoy it, New Jersey fans because he won’t be around forever. He is a baller for sure, but I am a Roy fan. Much respect to this man though.